This NEW Design is a symbol of Law and Order! This tie represents a desire for law and order! It also represents a community of people and the desire to accorded such ends humanly. The gentleman that adorns this neckwear seeks to live a life upright and in adherence to the law that supports community and excellence. This NEW 100% Silk Bow Tie Set symbol and colors represents and refers to learning from the past and building for the future. This tie symbolizes taking from the past what was good and bringing it into the present in order to make positive progress through the benevolent use of knowledge. The person who wears this tie has reflected on the past, and taking action to build for a successful future for the community. This NEW Untied adjustable 100% Silk Bow Tie Set symbol and colors represents and refers to learning from the past and building for the future. NEW DESIGN...We call this one of a kind tie, "Kente Blue." This design is known as nwenton in Akan. This beautiful color coordination complements and accentuates any suit or jacket combinations. NEW and one of a kind!!! This NEW DESIGN of 100% Silk is a symbol of vigilance and war! This symbol is used as a symbol of readiness for war or a call to action. The person who wears this tie indicates they are ready to take on a feat, challenge or day where one knows it will be a battle. Where it with pride and overcome any obstacle! The NEW colorful Bow Tie Set With Matching Hanky accentuates any suit or jacket combination. These distinctive colors are best known and most recognized as Kente. This beautiful color coordinated Tied Bow Tie complements and accentuates any suit or jacket combination. The beautiful silk tie shows a multitude of African Masks. The African mask often represents a spirit of ancestors and it is strongly believed the spirit of the ancestors are manifested within the wearer. These masks are worn in ceremonial, religious and social events representing spirits of ancestors. NEW DESIGN!!!! 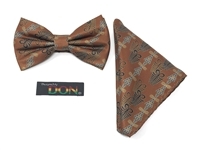 Our beautifully designed Tied Bow Tie has a culturally unifying Akan symbol. We refer to this colorful and purposefully designed neckwear as our AKANIC tie which symbolizes the importance of UNITY IN DIVERSITY, DEMOCRACY, AND UNITY OF PURPOSE. In Akan symbolism, there is a design of crossed crocodiles joined at the center. FUNTUMFUNAFU DENKYEM FUNAFU - JOINED CROCODILES Symbol of UNITY IN DIVERSITY, DEMOCRACY, AND UNITY OF PURPOSE. They are joined at the stomach. From the proverb: Funtumfunafu, denkyemmfunafu, won afar boom iso wodidi a na worefom emir se Duane ne de ye di no mine twit mu, Literal Translation: Two headed crocodiles fight over food that goes to a common stomach because each relishes the food in its throat. This symbol, in essence, depicts the Akan notions about the inherent difficulties of reconciling individual and group interest in a democratic system. The man who wears this neckwear prepares himself to a reconciler, healer, and resolver of conflict among those he encounters in his business, family and social life. Our beautifully designed Untied Bow Tie has a culturally unifying Akan symbol. We refer to this colorful and purposefully designed neckwear as our AKANIC tie which symbolizes the importance of UNITY IN DIVERSITY, DEMOCRACY, AND UNITY OF PURPOSE. Literal Translation: Two headed crocodiles fight over food that goes to a common stomach because each relishes the food in its throat. This symbol, in essence, depicts the Akan notions about the inherent difficulties of reconciling individual and group interest in a democratic system. The man who wears this neckwear prepares himself to a reconciler, healer, and resolver of conflict among those he encounters in his business, family and social life. This NEW Tied Bow Tie is a Symbol of Endurance and Resourcefulness. The Fern is a strong and durable plant that has the fortitude to grow and prosper in the most challenging conditions. The gentlemen who wears this symbolic tie suggests he had endured many of life's challenges and plans to prosper from the wisdom and knowledge of the experiences in life. This NEW Untied Adjustable Bow Tie is a Symbol of Endurance and Resourcefulness. This is one of our NEW symbolic design. One of our mostly richly designed neckwear our consumers fondly refer to as, "The Source of Power Tie." The colors Black and Silver coupled with Akan symbol Gye Nyame represents Excellence. Gye Nyame is a symbol of the omnipotence of God. One who wears this makes a statement: "I fear none because I believe in him." Gye Nyame is a symbol of the omnipotence of God. One who wears this makes a statement, "I fear none because I believe in him." The NEW colorful Tie Set With Matching Hanky accentuates any suit or jacket combination. Symbol of Law and Order! The tie represents the importance of justice! The symbol signifies the importance of discipline, fairness and justice. Reclaim our freedom to proclaim our heritage and the importance of being JUST in all our actions and interactions. This NEW DESIGN brings a symbol and its vibrant color which conveys the idea that, "Wisdom and understanding are key to all life endeavors. Being wise implies broad knowledge, learning, experience and the ability to apply such faculties to practical ends." The man that adorns this beautiful neckwear commits to seeking knowledge and wisdom in order to conduct Gods efforts in behavior that is circumscribed and tempered in awareness. 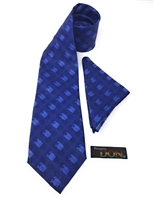 This beautiful color coordinated tie complements and accentuates any suit or jacket combination. This NEW Neck Tie is a Symbol of Endurance and Resourcefulness. This NEW 100% Silk Cube Combo Set called SANKOFA has it all!! 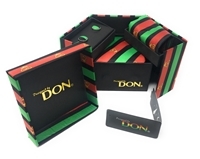 Necktie, Matching Hanky, Matching Cufflinks and a beautiful Matching Box. A souvenir and a great gift to self and anyone!! This keepsake can be kept on any office table, dresser, counter and any place to be seen to represent the symbol and colors... "learning from the past and building for the future." The person who wears this combination has reflected on the past, and taking action to build for a successful future for the community.